2. A Man’s A Man. Excerpt read by The First Minister, Alex Salmond. 3. A Man’s A Man. 4. John Anderson, My Jo. 5. Address To The Toothache. Read by Wilson Ogilvie. 6. Ye Banks & Braes O Bonie Doon. 7. Death & Doctor Hornbook. Excerpt read by Stephen McConnachie. 8. Ye Jacobites By Name. 9. Nithsdale’s Welcome Hame. Read by Colin Hunter McQueen. 10. Instrumental: Parcel Of Rogues. 11. Instrumental: Charlie, He’s My Darling / Duncan Davidson / My Love, She’s But A Lassie Yet. 12. To A Louse. Read by Ken Simpson. 14. Yestreen I Had A Pint O Wine. Read by Eliza Jane Brown. 16. The Weary Pund O Tow. Read by Archie Comrie. 19. Letter From Burns To Peter Hill. Excerpt read by David Murray. 1.The Deil’s Awa Wi Th’ Exiceman. 2. A Red, Red Rose. 3. O, Were I On Parnassus Hill. Read by David Scott. 4. Of A’ The Airts The Wind Can Blaw. 5. To A Mouse. Read by Alex McI. D. Kelly. 7. Instrumental: Duncan Gray / Corn Rigs. 8. Epistle To Davie, A Brother Poet. Excerpt read by Iain Doole. 9. It Was A For Our Rightfu’ King. 10. The Lass O Ballochmyle. Read by Jim Bowes. 11. A Rose-bud By My Early Walk. 12. Instrumental: Beware O Bonie Anne / Lady Mary Ann. 15. Winter. Read by Gordon Johnston. 16. There’ll Never Be Peace Till Jamie Comes Hame. 17. Parcel Of Rogues, read by David Scott. 20. Excerpt read by David Murray. 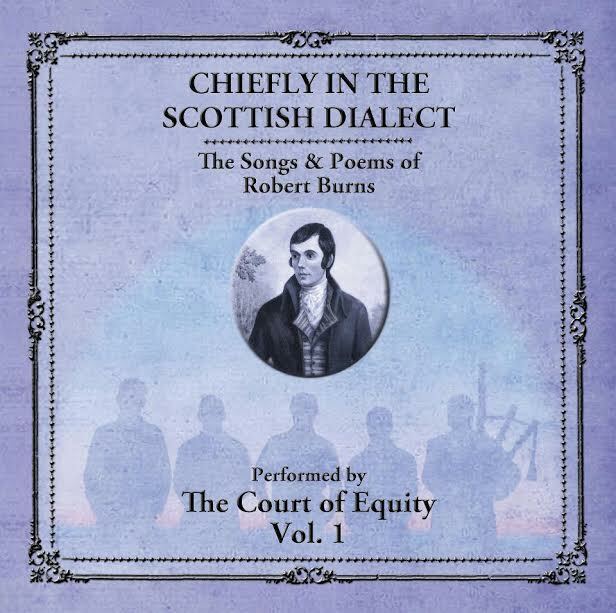 One of the best all round compilations of the works of Robert Burns has been created by the Court of Equity and produced by Greg Freil and Douglas McQueen Hunter. Several years of research, planning and recording have culminated in the release of two magnificent studio albums celebrating the life and works of Robert Burns. 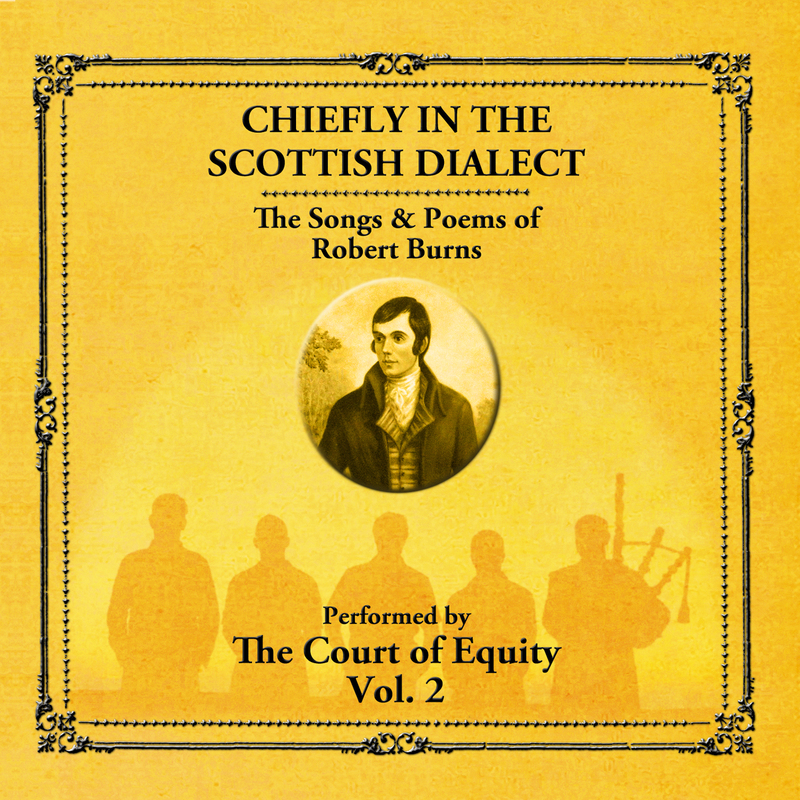 The works of Robert Burns are beautifully brought to life by the Court of Equity. Robert Burns himself took great pride in ensuring that his words reflected life in every part of his beloved Scotland and ‘Chiefly in the Scottish Dialect’ is as relevant today as it was when written in the 18th century. ‘Chiefly in the Scottish Dialect’ – Volumes 1 and 2 contain thirty nine pieces of the magnificent works of Robert Burns. Over twenty pieces of music and song celebrate the genius of the Bard. His journeys to Edinburgh, the Lothians, the Borders, the Highlands and beyond all fuelled his songs and poetry which the world continues to celebrate. Lothian Burns Club and ‘World Tam O’Shanter Champion’ David Scott past president of the Borders Association of Burns Clubs contributed to the performance. © 2019 The Picts Official Website. All Rights Reserved.